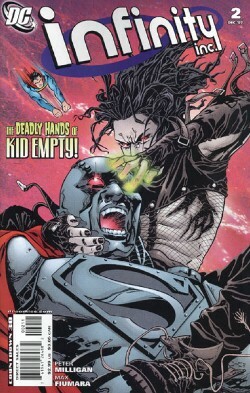 "Luthor's Monsters - Part Two"
Two Nuklons talk to one another, only to disappear as Fury comes into the room. They consider that perhaps Infinity, Inc is all that they have left. Erik (Fury) laments his mother finding him "accidentally" taking her dresses. Superman appears at John Henry's lab. Henry indicates he'd appreciate help finding Natasha, so Superman searches for a 200 mile radius, returns, and they note that all of the former Infinity, Inc kids have mental problems, because of what Luthor did to them. A girl named Sally laments that she hears the dead, watching the story of the murdered family on the news. She gets the suggestion to contact Natasha, only Nat's disappeared. John Henry visits Hope Taya in witness protection. She throws him on the ground before recognizing him. She suggests that Mercy wouldn't be as kind as she's been, and that she has no idea where Luthor is. Sally, now in the middle of New York, meets a young man who is also from the Everyman project. He's not creeped out by her, and they hit it off. John Henry questions Erik and Nuklon, and they play dumb, until Nuklon's doppelganger admits that he used to have a crush on Natasha. Still, dead end. John Henry hangs up the phone later to noise, follows it, and finds nothing. Sally's friend reveals himself to be the murderer from last issue, now calling himself Kid Empty. John Henry finds Sally's father killed, and bursts outside just in time to save Sally from Kid Empty. Kid Empty turns on Henry and begins to attack. Story - 4: Getting better, for sure. I can see potential unraveling here, and there are even some good scenes. I like the new character, I like what was done with Nuklon, and I'm even beginning to get where everything is without looking back to reference, so it's much more enjoyable in that respect. The scene at the end and the scene with Superman were both pretty darn well done. Where this issue still fails is the red herrings and wasted time. For instance, John Henry going to Hope, while a neat geek-out moment, didn't really follow from the story, and Steel chasing a phantom and not having it go anywhere was also a bit off. Still, now there's a rationale for the therapy and an explanation, a clear direction and a focus, and we've gone from repeatedly establishing Kid Eternity's modus to actually acting on it, so I'm starting to dig this series, as long as it keeps its head on straight and focuses on the story and not tangential cuteness. Art - 4: The art's still a little shaky, and some things are hard to figure out. I like the darker style for this story, but at the same time, clarity suffers, to a degree. I KNEW it was Hope, for instance, and the dialogue even said so, but I had to question if it was a different Hope because of the art. But it is getting better, and the backgrounds are quite good, as are the colors. It'd be a 3.5 if we had it, so I leaned four. Cover Art - 5: A really strong cover, with a bold image that immediately made me want to try and like this book. It makes the formerly lame sounding villain from last issue pop a lot more, and drug me into the beginnings of liking this book.